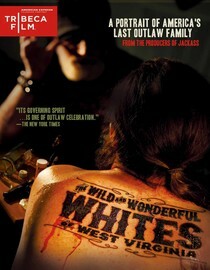 This documentary follows the infamous White family from West Virginia for a year. These self-proclaimed hillbillies are incredibly wild. They're part drug-addicted philosophers, part rebels and completely unlike anyone I've ever met in my life. They take the hillbilly stereotype, blow it completely up and then recreate it in your mind. For the most part they're incredibly quick-witted and sharp in their own way. The decisions they make would make most people vomit but they just light up another joint and keep going. It's really hard to review this movie. It's impossible to explain the characters in this film. The person that told me about this movie couldn't really explain it either. They just said I had to watch it and I'll say the same to you. It's unlike anything I've ever seen. However, if you're bothered by excessive drug use, portrayals of crime and foul language you should stay away. If by chance you do check it out, come back and let me know how you'd explain it. Why is it in your queue? A friend told me how crazy it was. I now agree. Best thing about the movie? Wondering what on earth they will say/do next. It's full of surprises. What mood should I be in to watch this movie? Not really sure. Which Way Home isn't it, but it does look good! I hate that it's so difficult to find! I'll have to give that a try. Don't worry about where you comment, I don't get many on here I'm just happy to have some!